Charlotte, our nutritionist, has worked hard with our staff in bringing in new and more cost-effective nutritional products. We were focused on quality and made every attempt to not use any neutraceuticals manufactured in China. We sought companies that had U.S. government standards for their manufacturing processes and were willing to analyze every new batch for quality and labeled dose. The COEM is not anti-drug but we believe in the principles of natural medicine. If a natural source is effective and available, why use a synthetic pharmaceutical manufactured product? In a survey of reported deaths to our nation’s poison control centers over the last 7 years, only 20 were thought to be related to neutraceuticals as opposed to hundreds of thousands caused by adverse effects of drugs. We are proud to provide you with safe and high quality nutrients. Look at the many new products presented below. Many will replace older products while some are new and exciting neutraceuticals. This unique broken cell wall blue-green algae has been the subject of so many research studies, whole books have been written about it. Its anti-oxidant, detoxifying, and nutritional properties are well-documented, and its rich supply of nucleic acids can be used for cell renewal and repair. We use it as one of our key detox nutrients because it binds toxins and helps remove them from the body. This item replaces our former Sun Chlorella. 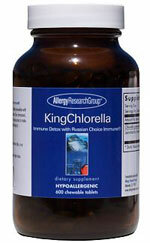 Each tablet supplies 200 mg of Chlorella and 30 mg Lactobacillus rhamnosus lysate powder (Russian Choice Immune). 600 chewable tablets. Directions: Take six tablets at bedtime or with a meal. For more intensive use, take six tablets twice a day with meals. 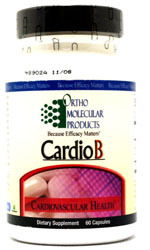 This product has been shown to help break up and dissolve excessive blood clotting and to support fibrinolytic activity. The vitamin K2 has been removed from Nattokinase. Nattokinase is an enzyme derived from soy and may cause an allergic reaction in those that are extremely soy-allergic. This product replaces our former Nattokinase product. 100 mg. 60 capsules. Directions: Take one capsule two times daily with 8 to 10 ounces of water, on and empty stomach, between meals. A nutritionally complete enzyme formula based on the original European research of systemic enzyme therapy. Systemic enzymes act as immunomodulating agents that are helpful in inflammatory conditions, degenerative disease, and pain syndromes. Each tablet is enterically-coated to protect against dissolution in the gastrointestinal tract. This product replaces our former Catalytic Formula. Each tablet supplies 100 mg Pancreatin (8X USP), 60 mg Papain, 50 mg Rutin, 45 mg Bromelain, and more active enzymes. 200 tablets. Directions: Take two tablets two times daily between meals (1 1/2 hours before an after meals) to break down irritating compounds and proteins in the bloodstream. For severe degenerative disease, take three tablets three times daily between meals. A proper balance of fatty acids is as important to good health as are vitamins and minerals. This supplement is desirable whenever Gamma Linolenic Acid (GLA) is needed to boost beneficial prostaglandins which help counteract inflammation and provide a sense of well-being. It has been used in eczema, chronic fatigue, and certain forms of chronic depression. Borage oils provides a higher ratio of GLA to linoleic acid than Evening Primrose Oil and similar plant oils. This product replaces our former Evening Primrose Oil. Each 1,000 mg softgel provides 1,000 mg of cold-pressed Borage Oil, supplying 200 mg of Gamma-Linolenic Acid (GLA) and 7 mg of Mixed Tocopherols (Vitamin E). 100 softgels. Directions: Take 1 softgel two to three times daily with meals. DHA is the most abundant fatty acid in the brain and is vitally important in neurological development, as well as formation of the retina of the eye and visual cortex. It can be especially helpful for Attention Deficit Disorder. 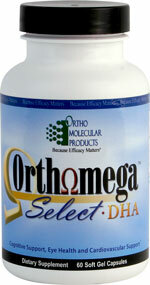 Each softgel contains 100 mg DHA only (no EPA) from a non-fish algae source which is naturally high in DHA. 50 softgels. Directions: Take one softgel one to two times daily with meals. For children, softgels may be pierced and contents squeezed on food. This is a mercury-free purified fish oil especially high in DHA, in the highly beneficial re-esterified triglyceride form. Most fish oils are not. 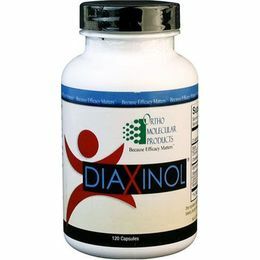 DHA is a structural component of all cell membranes and helps form several neural transmitters such as phosphatidyl serine. It is strongly anti-inflammatory and can be extremely helpful for cardiovascular disorders. 90 softgel capsules. Directions: Take one sofgel one time daily with a meal for adults only due to high potency. Provides comprehensive herbal adrenal support, through standardized extracts of Siberian Ginseng Rhodiola rosea Root, Schizandra Berry, Ashwangandha Root, and Licorice Root, with added vitamins. 120 capsules. Directions: Start with one capsule with breakfast. Work up to one capsule with breakfast and lunch. If necessary, increase to two capsules each with breakfast and lunch. Provides a blend of natural high-antioxidant fruits and plant extracts for children with constipation. This tasty liquid contains plum extract, fig extract, psyllium seed extract (a bulking agent), fennel seed extract, caraway seed extract, coriander seed extract, and ginger root extract. Ginger soothes the stomach and drives gas. This is a Kosher product. 250 ml (8 fl. oz). Directions: Children up to 6: 1-3 teaspoons daily as needed. Children 6-12: 1-2 tablespoons daily as needed. Adults: 2-3 tablespoons daily as needed. Note: This product may harmlessly and temporarily color the bowel when it is present (like all foods will do) for a maximum of 48 hours. In order to clean out the colon before a colonoscopy, it is better to wait a day or two after using any natural laxative such as Super Aloe and instead use the colorless non-natural (chemical) products and procedures the gastroenterologist recommends for a colonoscopy prep. Contains 250 mg or 450 mg Cape Aloe per capsule. 100 capsules. Directions: Take 1 capsule with dinner or at bedtime (allow 24 hours before redosing). Considered state-of-the-art bioavailable minerals. May contain potato starch. This product replaces our Cal Mag 1001. 200 mg calcium glycinate chelate and 100 mg magnesium glycinate chelate per tablet. 180 tablets. Directions: Take two tablets at a meal when you are not taking your zinc or multiple vitamin/mineral supplements since calcium and zinc compete for the same binding sites. This formula is used for the treatment of fibrocystic breast disease and other abnormal breast tissues, as well as in the treatment of hypothyroidism and iodine deficiency. This product replaces our Iodoral. Each capsule supplies 12.5 mg total iodine. 90 capsules. Manganese is a trace mineral that is important as a cofactor in many enzymes in the body. It is also necessary to make bones and tendons. Note: Supplements of individual trace minerals like Manganese are usually only recommended short-term to replete deficiencies. 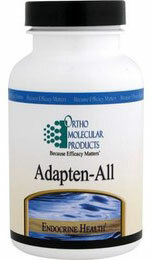 Please re-test mineral levels in six months to determine if this supplement is still needed. Since all minerals work in balance, we do not wish to over-supply manganese long term. This product replaces our Manganese. 16.7 mg manganese per tablet. 90 tablets. Directions: Take one-half to one tablet daily with a meal, or take one tablet every other day with a meal. Magnesium citrate is better absorbed than other forms of magnesium by individuals with hypochlorhydria (low stomach acid). This water-soluble form of magnesium also seems to help patients with constipation problems Magnesium is an essential mineral that can improve cardiovascular function, increase the ability to use insulin properly, relieve muscle pain and inflammation, and reduce stress and hyperactivity. It may also be effective for asthma. This product replaces our Magnesium Complex. 150 mg magnesium per vegetarian capsule. 90 vegetarian capsules. Directions: Take one capsule one to three times daily with food. Capsules may be opened and stirred into food or liquids. Strontium is a naturally occurring mineral important for maintaining strong bones, particularly in postmenopausal women. Bones are a complex structure of proteins and several minerals, and strontium is one important support mineral. This product replaces our former Strontium product. 300 mg strontium per capsule 100 capsules. Directions: Take one to two capsules daily with or between meals, away from calcium-containing food or supplements. This is a broad spectrum, hypoallergenic, dairy-free probiotic supplement designed for children 2 years of age and older. Each naturally-flavored chewable tablet delivers potent amounts of 4 Lactobacillus and 4 Bifodobacterium species that benefit gastrointestinal, immune, and oral health in children. The xylitol used to sweeten this formula discourages dental plaque formation and tooth decay. 25+ Billion CFUs. 60 chewable tablets. Directions: Chew one to two tablets daily, preferably 30-60 minutes following a meal. This organic rice protein powder is designed for people who need low glycemic foods because of blood sugar issues (high or low). Each 2 scoop serving provides 10 grams protein, 17 grams carbohydrate, 3 grams of fat from flax seed flour (high in Omega 3’s) and 12 grams of dietary fiber. 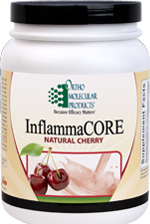 In addition, each serving provides 100 mg of Alpha Lipoic Acid and 5 mg of Vanadyl Sulfate. 942 g (33.2 oz) or 30 day supply. Directions: Due to the very high fiber content, start with 1/2 scoop daily in a smoothie (tastes best blended with fruit and a dairy-free milk like almond milk). Work up to 2 scoops daily in a smoothie for a meal replacement or snack. This is a hormone-free, ultra-low-temperature whey protein isolate and whey protein concentrate derived from cow’s milk. It also contains fructo-oligosaccharides (FOS), xanthan gum, natural vanilla flavor, and stevia (an herbal sweetener). Suitable for adults or children. Contains dairy. 703 grams (24.8 oz) or 28 scoops. Directions: Take 2 scoops daily in liquid of your choice or in a smoothie. Each scoop contains 12 grams protein, 16 grams carbohydrate, 2 grams fiber, good amounts of most needed vitamins and minerals in assimilable forms, plus multiple anti-oxidants that boost mitochondrial energy and detoxification including 300 mg N-Acetyle-L-Cysteine, 250 mg Acetyl-L-Carnitine, and 100 mg Alpha Lipoic Acid. This product is sweetened with Stevia, a natural herbal sweetener. 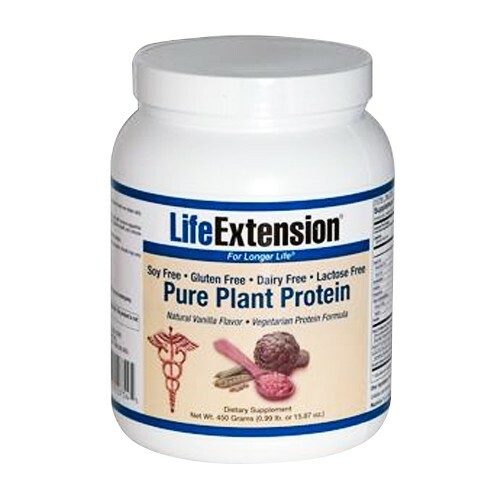 Totally free of gluten, dairy, or legume powders. Note: Tastes better mixed in smoothies. 933 grams (32.9 oz) or 30 scoops. Directions: Take one scoop in your favorite beverage one or two times per day. Protein powder derived from high-quality rice, pea, and artichoke flours with added branched chain amino acids for tissue support and repair. Each scoop provides 18 grams of protein, 110 calories, 7 grams carbohydrate, 2 grams of fiber, and 5 grams of fat, as well as 1875 mg of oat bran, 1500 mg of inulin/FOS, and enzymes. Sweetened with fructose and Stevia. 450 grams (15.87 oz) or 15 scoops. Directions: Take one scoop one time daily mixed in water or beverage of your choice, or in a smoothie. 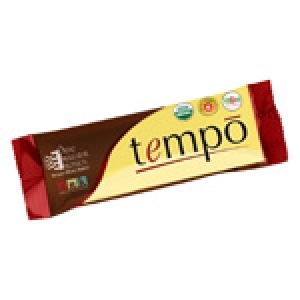 A low-glycemic bar designed for those with diabetes or insulin resistance. Each bar contains all certified organic ingredients providing 12 grams of protein from brown rice protein and cashew butter, 9.5 grams of fiber, 200 calories, 6 grams of fat, and key vitamins and minerals for blood sugar balance. Sweetened with organic agave inulin and natural flavors. Directions: Take 1/2 to 1 bar before or after exercise or when needed for an on-the-go snack. This combination of vitamins has been proven to effectively and safely lower elevated homocysteine. Each capsule contains therapeutic doses of nutrients including 5 mg Folic Acid, 50 mg Vitamin B6, and 1 mg Vitamin B12 as well as 500 mg Trimethyl Glycine (Betaine). Betaine is included as a methyl donor to convert homocysteine to the natural, safe amino acid methionine. 60 capsules. Directions: Take one capsule per day. This form of Vitamin B3 is often supplemented (under physician’s supervision) to help control high cholesterol levels and relieve pain of osteoarthritis. However, an excess of B3 can be toxic and upset the balance of B vitamins or even cause liver problems in some individuals. This product replaces our former Niacinamide product. 500 mg Niacinamide per capsule. 100 capsules. Directions: Use only as directed by physician. Directions: Take 1/4 to one capsule daily with food, depending upon your weight. For children, capsules may be opened and mixed with food. This sustained released form of niacin (not niacinamide) enables as much Vitamin B3 to be released without flushing as possible while also decreasing the risk to the liver of high-dose Niacinamide type products. 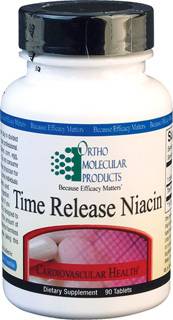 Time release niacin is helpful for managing high triglycerides, LDL and total cholesterol. 500 mg time release niacin per tablet. 90 tablets. Directions: Take one tablet one to two times day with food. Do not take with hot drinks or HCL supplements. 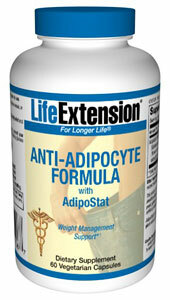 Diabetics and Insulin Resistance: Watch fasting blood sugar as over time it will probably decrease with this product. The “next generation” of Vitamin E, tocotrienols are emerging as powerful new anti-oxidants for supporting healthy cholesterol balance, combating arterial plaque, maintaining healthy glucose and triglyceride levels, and reducing the risk of cancer. This product replaces our former Annatto Tocotrienols product. 125 mg tocotrienols as 10% delta tocotrienols and 90% gamma tocotrienols per softgel. 60 softgels. 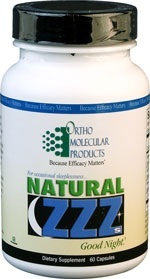 Vitamin K2 as MK7 (Menaquinone-7 derived from Natto Extract) is needed for building bone. It also aids cardiovascular health by helping maintain arterial elasticity. Although Natto is derived from soy, this product is free of soy protein and can be taken by individuals who do not have a severe soy allergy. 90 mcg MK7 per softgel. 60 softgels. Directions: Take 1 softgel daily with a meal. If you are taking anti-coagulants such as Coumadin, consult your doctor before taking this supplement. This formula targets acipocyte (fat cell) creation, slows down fat cell growth, and induce lipolysis (breakdown) of fat cells. It contains plant extracts of Sphaeranthus indicus flower and the mangosteen fruit. 400 mg adipostat proprietary blend per vegetarian capsule. 60 vegetarian capsules. Directions: Take one capsule two times daily 30 minutes before meals. For optimal results, walk 20 minutes per day and maintain a 2,000 calorie diet per day or less. 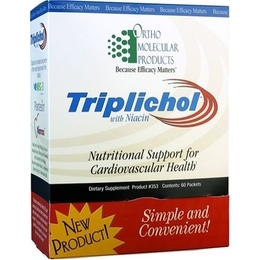 This formula supports cardiovascular health and normal blood pressure, as well as helping to overcome insulin resistance and metabolic syndrome. This product replaces our former Berberine product. Each capsule contains 330 mg Berberine HCL and 100 mg of the anti-oxidant Grape Seed Extract. 90 capsules. Directions: Take one capsule three time daily. This comprehensive formula is designed to support blood sugar levels and cardiovascular health. Each two capsules contain 3,000 mcg Biotin, 800 mcg ChromeMate chromium, 400 mg standardized Gymnema Leaf Extract, and 50 mg Vanadyl Sulfate Hydrate. Research has shown each one of these ingredients to be highly effective in helping to normalize blood sugar. Such therapeutic amounts are usually only found in separate bottles of each nutrient, thus making this combination easier and more cost-effective to take. This product replaces our former Vanadyl Sulfate and Biotin 8 products. 120 capsules. Directions: Take one capsule two times daily with meals. 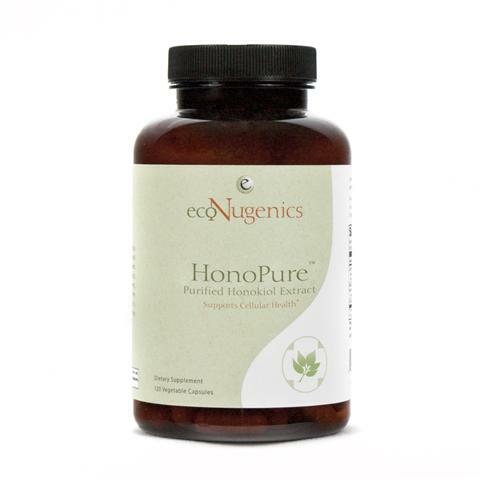 This formula contains the most potent Honokiol available (98% purity). This unique extract has been extensively researched for its ability to promote cellular health. HonoPure comes from Magnolia bark which has been used for centuries in Traditional Chinese Medicine. This product is a safe and effective cellular health solution. 120 vegetable capsules. Directions: Take two to four capsules one to three times a day, preferably with food. 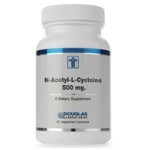 N-Acetyl-L-Cysteine enhances detoxification, liver function, immune support, and antioxidant activity. This product replaces our former Cysteplus. 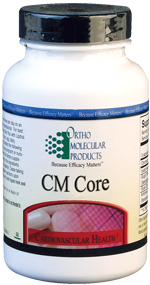 Each capsule provides 500 mg of this nutrient. 90 vegetarian capsules. Directions: Take one capsule two times daily on an empty stomach between meals for detoxification. For Parkinson’s Disease, take one capsule three times daily between meals. This natural herbal sleep aid helps one to go to sleep and stay asleep. Each two capsules provide standardized extracts of 450 mg Valerian Root, 300 mg Jujube Seed, 200 mg Passion Flower, plus 100 mg L-Theanine that helps calm the brain and reduce stress. 30 capsules. Directions: Take two capsules before sleep, preferably up to one hour before bedtime. This comprehensive formula contains many nutrients that have strong anti-inflammatory and anti-oxidant properties and have been studied for their potent anti-aging and immune-enhancing properties. This product replaces our former Resveratrol product. Each two capsules contain 200 mg Quercetin (to help prevent allergic reactions), 150 mg Broccoli Seed Extract, 150 mg Pomegranate Seed Extract, 100 mg Trans-Resveratrol, 100 mg Alpha Lipoic Acid, and 60 mg Pterostilbene. 60 capsules. Directions: Take one capsule two times daily. Each convenience pack contains a full therapeutic dose of key nutrients to balance blood lipids and support proper cardiovascular function. This is an extremely effective product and has a money-back guarantee, with improvement being guaranteed within 6 months of continued use, as proven by before and after blood lipid studies, or your money will be refunded. It works best when paired with a diet low in fat, cholesterol, and sugar, with the addition of a full daily dose of Multi-Thera 1. We will be happy to work with you with our Cardiometabolic Program if you like. Each two packets contain 1.3 grams plant sterols, 1,160 mg DHA, 120 mg EPA, 250 mg Grape Seed Extract, 300 mg Quercetin, 300 mg Green Tea Extract, and 100 mg Trans-Resveratrol. 60 packets. Directions: Take one packet with breakfast and one packet with dinner.